In our family, we have certain foods that we consider road trip food. Not only do you HAVE to have them at some point during a road trip, but you will typically never find them in our house any other time. Little Debbie Oatmeal Cream Pies are one of those treats, at least for the boys in our family. 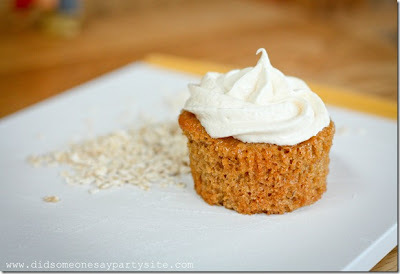 So I am pretty sure they would love these oatmeal cream pie cupcakes from Did Someone Say Party. I think we will have to save these for home. They don't quite have the same easy to eat in the car road trip appeal. If you are an oatmeal cream pie fan, you can get the recipe HERE. Which cake are you like?